I have been to Iligan City and Cagayan de Oro City for a couple of times before and seeing the news regarding the devastation caused by Typhoon Sendong in some parts of Mindanao just caused my heart to bleed. 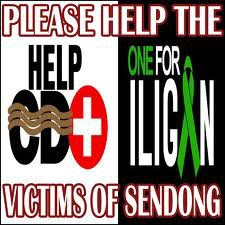 For those who wanted to help / donate via Paypal, just visit Iligan Blogger's Society, Inc (www.iliganbloggers.com) for details. You can also donate thru: GMA Kapuso Foundation and ABS-CBN Foundation Sagip Kapamilya.